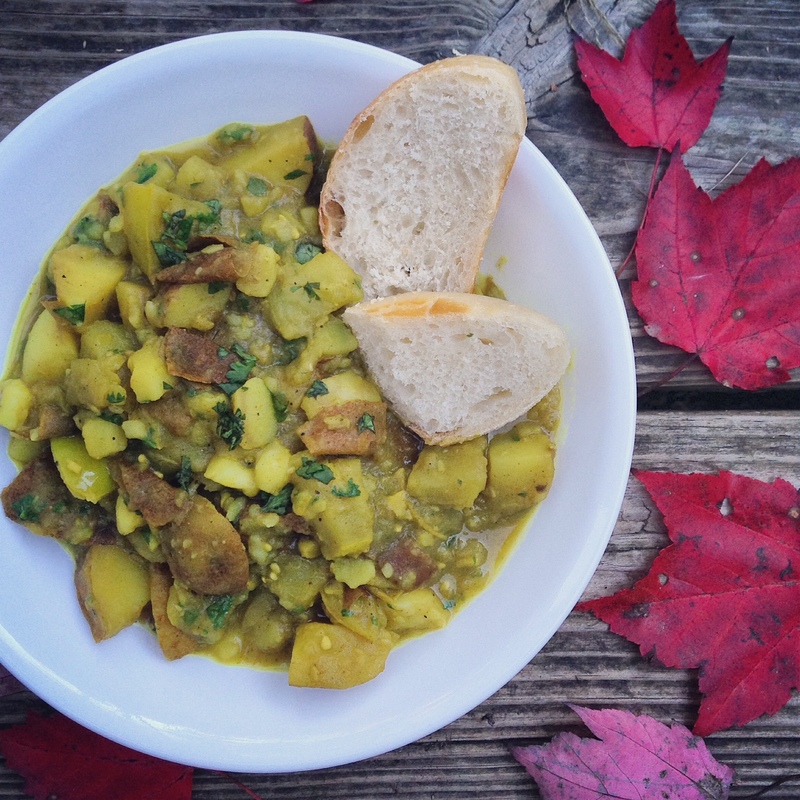 Green Tomato & Potato Curry. | Eat More Plants. I love coming across a recipe that is insanely simple and delivers such tasty results. I also love one-pot meals…who doesn’t…?! No mess, no fuss. I took all my green tomatoes out of the garden the other day because the almost freezing night temperatures haven’t been doing any good to them. I started seeing little white spots on some of them, so I wanted to collect them before they went to absolute crap. 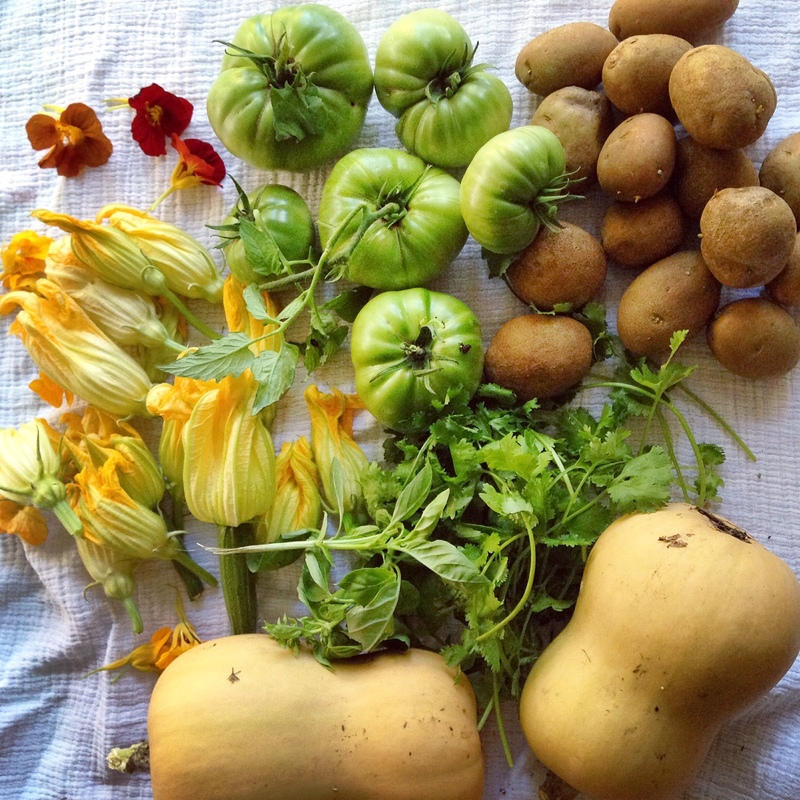 Besides fried green tomatoes, what the heck can you do with green tomatoes?! I googled it, of course. I came across a few new ideas but this curry struck me as the most exciting. And luckily I had all the ingredients. At first glance, this dish looks almost too simple but I assure you, once you start smelling the garlic and the spices while you’re cooking, you’ll be drooling. I know I was! 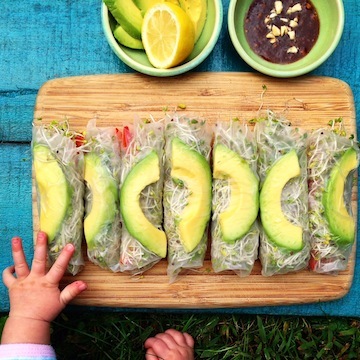 Also a good one to add to the repertoire of kid friendly dinners. She loved this one. Came back for seconds! Using a large skillet, heat the oil over medium heat. Add the garlic and stir until golden, about 1 minute. Start over if it burns; you do NOT want to eat burnt garlic. Yuck. Add the potatoes and tomatoes to the pan as well as the garam masala, salt and turmeric. Stir to combine. Cook for about 10 minutes. Add 1 cup of room temperature water to the pan and scrape up all the yummy bits from the bottom of the pan. When it starts to boil, turn the heat down to medium-low and cover. Stir every few minutes, keeping the heat medium-low and the cover on while you’re not stirring. After about 12-15 minutes, your potatoes should be soft enough to mash with a spoon or fork. Once everything is cooked down to a soft but still chunky texture, remove the pan from the heat and mash some of it up so that it gets thicker. Stir in the fresh cilantro. Feel free to use ripe tomatoes as needed! I will be making this again with regular tomatoes as soon as I can gather some. What a great alternative to fried green tomatoes. Delicious.